All transactions are safe and secure with a reliable history in online purchasing behind each of our associates. 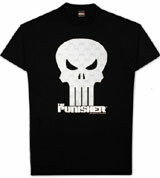 Buy The Punisher Crystallized Logo t-shirt to own Punisher clothing and merchandise. The design on this official Marvel Punisher apparel item includes a background of white skulls, which fills the larger off-white Punisher skull logo on the front of the tee. Underneath the logo, is The Punisher comic book title printed in white lettering. Fans will easily recognize the classic Punisher logo that incorporates a cartridge bandolier in place of a skull's teeth. Wear it with the Punisher belt (below). The leather belt displays a bullet-studded design. In addition to The Punisher Crystallized Logo tee above, browse the Punisher Clothing Gallery for more apparel like men's and women's clothes, kids shirts or hoodies.